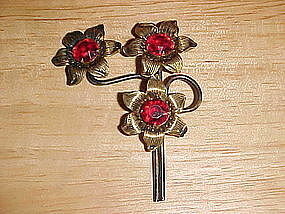 Vintage 1950's sunflower brooch with three (3) large ruby red rhinestones. Each of the 3 flowers contains one large set ruby rhinestone. This pretty pin is in fine condition and measures 2 3/8" long. Pretty vintage 1950's rhinestone pin. 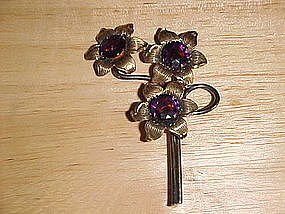 This pin has a nice patina and in the form of three (3) sunflowers, each with a set large amethyst rhinestone. This pin is in fine condition and measures 2 7/8" in length. 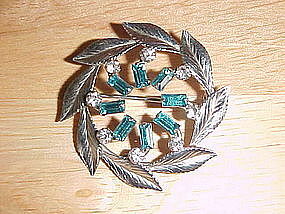 Beautiful 1950's vintage designer signed rhinestone brooch. 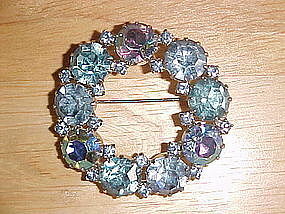 This circular brooch features set aqua marine and aurora borealis rhinestones. It is signed " KARU ARKE, Inc." and measures 1 3/4" in diameter. This brooch is in very fine condition!!! Vintage sterling silver and rhinestone pin. This 1950's vintage pin is in the form of a Wreath of Silver leaves with the center of set blue topaz and white diamond rhinestones. This pretty pin is about 1" in diameter and is signed " STERLING and also includes the famous Carl Art signature." This pin is in very fine condition!! Vintage pre-ban Ivory pin. 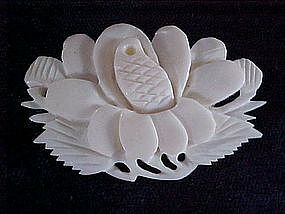 This pin is in a form of a carved Lotus blossom and is made from elephant Ivory. It was made circa 1960's - 70's. It measures 1 7/8" x 1 1/4" and is in fine condition. Note: This item can only be shipped within the U.S.A.
Vintage pre ban large Elephant Ivory pendant. This vintage 1950's - 60's is 2 1/4" in diameter and is 1/4" thick. It is in very fine condition!!! This pendant is in the shape of a disk and contains a swivelling inner disk that has Oriental characters of some sort of Luck symbol. Note: This item cannot be sold outside of the U.S.A. Extremely wonderful vintage 1920's - 30's ladies necklace. 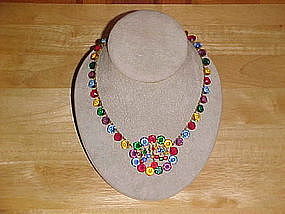 This art deco necklace is made of many multi colored crystals. This necklace measures 16 1/2" in length and is in very fine condition!!! It has the look of a piece from the collection of the Crown Jewels!!! A Real Show Stopper!! 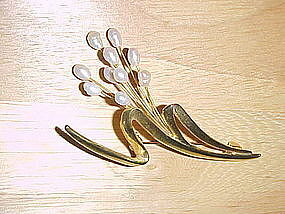 Super vintage 1970's brooch in the retro style. 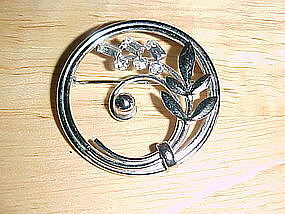 This pin is in the form of a stylize spray of flowers. Each flower is made of a genuine fresh flower pearl, which there are ten of them. The pin is in very fine condition and measures 3" in length. 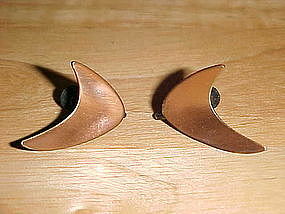 Nice pair of 1950's signed " KIM " copper earrings. These have a classic moderne shaped design. They are in fine condition and they each measure 7/8" wide. Lovely retro floral pin, made of silver with set of rhinestones. This 1950's pin is signed with the famous Carl Art arrow logo and also signed STERLING. 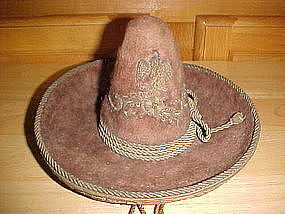 It is in very fine condition and measures almost 1 1/2" in diameter. It weighs about 1/2 troy ounce. 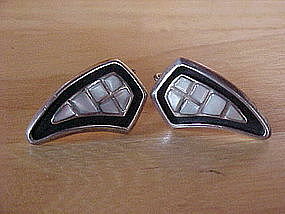 Pretty pair of vintage sterling silver earrings in the moderne style. These earrings are in very fine condition and each measures 1 1/16" long. They each have six abalone tiles incorporated within its design. Wonderful large vintage 1940's chunky retro brooch. 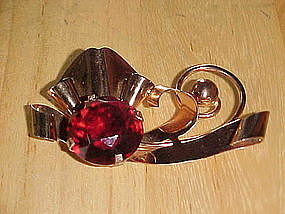 This brooch is in the classic retro style with gold wash and set with a very large Ruby colored stone. It is signed " STERLING " and measures about 3 1/8" wide x 1 7/8" high. It is in fine condition with few areas of thinning gold wash. This super pin is well weighted and weighs about 1 troy ounce!!! If you want to be seen when stepping out, this is the brooch for you! $ 45.00 - SOLD - THANK YOU !! Interesting vintage 1920's - 30's hand crafted compact. This Persian made compact comes with its original mirror. The outer case has hand tooled Persian designs. 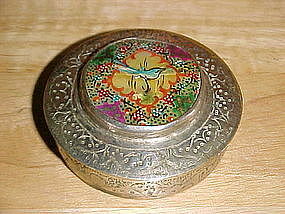 The lid features a beautiful incased mother of pearl medallion with a hand painted bird with a all over floral design. This compact is in very good condition and is almost 2 1/2" in diameter and about 7/8" high. 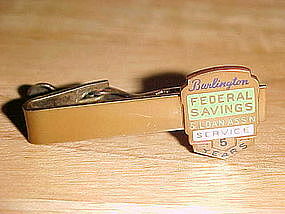 Vintage 10 year service tie clip given to employees of the now defunct Burlington, Vermont Federal Savings and Loan Association. This tie clip is in fine condition and measures almost 1 3/4" wide. The plaque has fine enameling work. A nice piece of Burlington, Vermont Historical Memorabilia. 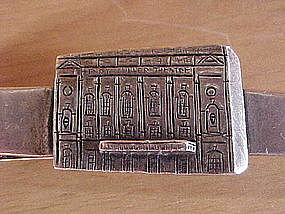 Vintage 1950's 5 year service tie clip. 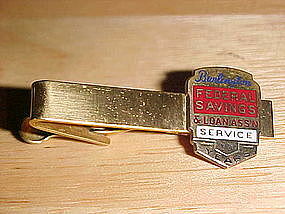 This was an employee award for 5 years of service at the now defunct Burlington, VT Federal Savings and Loan Association. This tie clip is in fine condition and measures 1 3/4" wide. 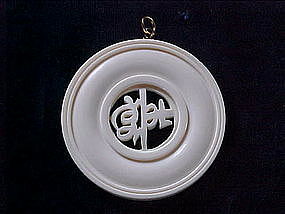 The plaque is made with fine enameling work. 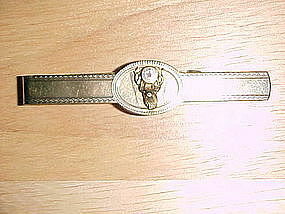 Wonderful vintage 1950's Anson Tie bar made for the Benevolent and Protective Order of Elks. This tie bar features the emblem of the Elks club and it is signed " ANSON 1/20 12K G.F." This tie clip is in fine condition and measures 2 1/2" wide. $ 250.00 - "SOLD" - THANK YOU!!! !